Fill out the form with any questions or inquiries you have for the sales consultants at Ruby Lake. You can also call or chat with us for immediate responses. The sales office will be closed on December 25th in observance of Christmas. Turn Right onto Palm Parkway. Ruby Lake will be on your left. At Ruby Lake, you can build your dream new home in an executive-style neighborhood, offering low-maintenance living and community amenities such as a pool, fitness center and fire pit. Discover customizable, open concept home designs, and see theme park fireworks from your front porch or covered lanai. This area of Dr. Phillips is growing and quickly becoming a hot spot for dining and shopping! New construction homes! 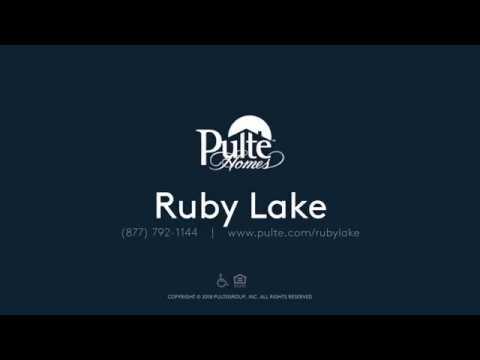 The life you want to live is waiting for you at Ruby Lake. Explore this community and see for yourself. Save even more with special offers. The Diamond homes at Ruby Lake feature large floorplans and 1-2 story designs. Explore your options today. The Emerald homes at Ruby Lake offer features including like a private owner's suite, covered balcony options, and island options. The Dockside, by Pulte Homes, a new Home Builder, offers a large kitchen space. Pulte Homes Features the Dockside, a New Construction Home in Dr. Phillips. The Dockside is a Modern House Plan by One of the Nation's top New Home Builders. New Construction at Ruby Lake Gives You the Felxibility to Create a Space Designed for You. If you are looking for space, the Dockside, in a new home community, has what you need. From the spacious first floor gathering room to the oversized loft upstairs. The Stonehaven exudes space with a large open kitchen and gathering room, an optional loft with bedroom suite, and the owner's suite on the first floor. Siena, a new build, invites entertaining with an open kitchen and oversized island, formal dining room, and naturally lit gathering spaces. The Aurora has the Option for a Media Room at Pulte Homes. The Aurora is a new home for sale in Dr. Phillips that offers a wow factor with a 2-story foyer, a media room and oversized loft space. The Richmond, a new construction home, spoils owners with a private retreat, covered balcony option, and huge walk-in closet with optional island. The Pompeii, a new construction home, including the spacious Owner’s Suite, multipurpose room off the kitchen, and covered lanai. Pulte Homes Features the Cyprus, a new Construction Home in Dr. Phillips with Covered Lanai's. The Cyprus is a new home for sale in Dr. Phillips that features an open kitchen and options to make your home your dream home. The Casoria is a new home for sale in Dr. Phillips that is perfect for families of all sizes with a lot of customizable options to fit your needs. Stillwater is defined by its roominess with a huge upstairs loft, formal dining room, and an oversized window-lit gathering room. No New Quick Move-In Homes Available from the Diamond 60ft Home Sites Series at this time. With resort-style amenities right in your backyard and the ability to build your dream new construction home, this area of Dr. Phillips is in high demand. With shopping, dining, and entertainment coming just minutes away, you'll be able to walk to dinner! Located just outside of Orlando, FL in the Doctor Phillips area, Ruby Lake, new construction homes, boasts easy access to Restaurant Row, Universal theme parks, and shopping on Sand Lake Road. Major grocery chains such as Publix, Trader Joe's and Fresh Market are a short 5-minute drive away. The Doctor Phillips A-rated schools are right around the corner from the community. Easy access to I-4 lets you travel easily within Central Orlando. Enjoy Ruby Lake's resort style amenities right in the heart of Dr. Phillips. Choose from our 11 stunning floor plans and make it into your new beautiful home. Our residents are at the heart of every Pulte community, and there is always something happening. From exciting offers to home events, we invite you to see what’s going on in the neighborhood. Have You Heard? Orlando's Mortgage Rates Have Dropped! Secure a great rate right now, with mortgage rates at their lowest in a year. Discover how much more affordable your payments could be. Take a virtual tour of the Richmond to see how this house flows from room to room. From the basic prewire, to a full suite of automation, make your home exactly as smart as you want it to be. The future is here with Smart Home from Pulte. *Must be a USAA member and provide member number by purchase agreement effective date. Offer valid from 1/1/19 - 12/31/19. See sales consultant for details. Take a tour of the Cyprus home design! Take a virtual tour of the Stonehaven to see how this house flows from room to room.